I just wanted to brag that I've been home for 10 days and in that time I've finished 11 minis. And I have 7 more in progress that will be finished this week for sure, and hopefully in the next few days. It won't last, but it's exciting haha. Although, as always, pictures or it didn't happen! And, I just finished the next 7 I was talking about. (Well, tomorrow they get varnished and then a couple get bow strings). Pictures should come shortly after that. The next batches are a bit weird. I have 4 sisters of sigmar, 4 Blood Bowl High elves, a vampire, a necromancer and two ghouls. Not exactly perfect for batch painting. I was going to post some pictures. But then I remember I'd have to upload them first. So instead I'm going to paint some more. Necromancer and 1 ghoul done. 4 sisters progressing well. Well, you could never be worse than me. This morning I finishes the last piece of a Mordheim box I bought when it was published in..... 1999. Not really a competition I care to win, but I have plenty of minis that I've had since the late 80s that still lack paint. I’m waiting for such a guy to come in the post so I can get cracking! Didn't finish the bloodbowl minis yet (again). But the rest are done. Along with 17 Night Goblins, a Doomdiver, 5 Squigs, 13 snotlings, Skarsnik and Gobla, and 4 pre slotta elves (see, I still paint elves). Two Stone Trolls are nearly done. I've kept up a nice pace, I think I'm still hovering around a mini a day. Currently on the table I have 14 Night Goblins, 5 goblins, and a Marauder Giant. The goblins will go fast, but the giant is going to take some time. I like, especially the guy with the warhammer, great colour balance. I had to wait for the primer to dry on the giant, so I finished this. To bad it's finecast. I think the hair lets an otherwise perfect sculpt down a bit too. Still, even though I complain about the late warhammer models I have to admit this one is pretty nice. I remember when this hit - such a nice throwback to the old maiden guard models (including the hair!). Finecast is still a bummer but I've come to appreciate it light weight and the fact paint doesn't chip off it. The hairstyle is fine. But the strands of hair are a little thicker on this one than on the old ones. Which is sad, because finecast would have held finer detail just fine. I'm not sure I like the weight, but the paint thing I like a lot. I'm questioning if I even have to varnish it. It's a shame she disappeared again already. Bad GW! I like the model. Agreed that some of the details could have been fleshed out more, like the hair. But it's still a lovely model. I've found Finecast workable but thin elements can be very fragile. Metal for choice. Nice detail work on the Handmaiden Shannar and I like the greyish metal with the yellowish colours and the flesh tone. I've slowed down a bit on output, getting sick makes it hard to paint. But I'm 4 horses and a base away from something I said I'd paint a long time ago and then stalled on. I've also been working on my Marauder Giant. I've gone far to ambitious with my plan and it involves a lot a free hand (not my top skill, and I'm insisting on high quality). But IF I ever finish it's going to make a great Mordheim piece. But I'm 4 horses and a base away from something I said I'd paint a long time ago and then stalled on. Get well and start painting again goddamnit! 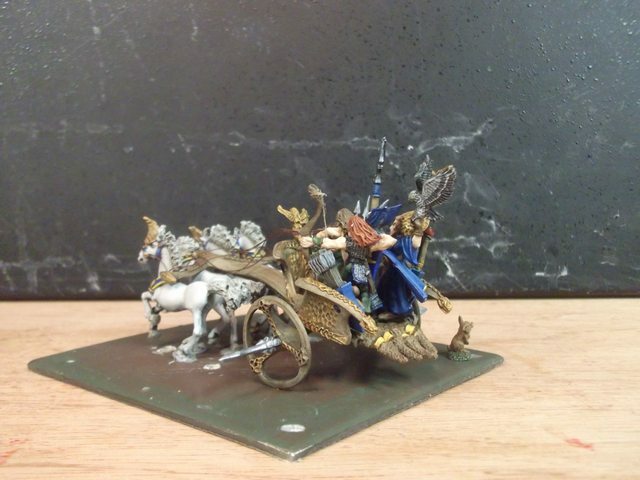 The Elven attack chariot is done, and I made reins for it. But the base needs work, and I'm not going to display it until it can be seen in all it's glory. I'm waiting on flower tufts. If any of you are on the oldhammer facebook group I did put pictures up there. I won't here yet because it takes a bit more work, so I'll save that for the finished product. Tonight I finished my sea elf bolt thrower, made real progress on the crew, and did a little work on 18 goblins. Hopefully tomorrow see the crew completed and the base positioning worked out, as well as a little work on the goblins again. i'm not quite sure how elves got priority again, but I guess I should ride it while it lasts. I don't think I've ever done this before, but here are some WIP pics. I'd also love some base advice on the bolt thrower. 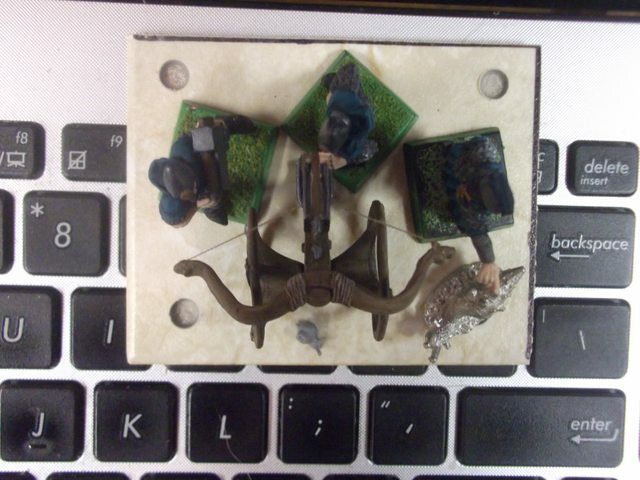 Grass would make it easier to hide the crew bases (they'll be magnetized to remove casualties), but these are sea elves. I was thinking about a freshly landed look. Sandy or stoney. Should I look for a turtle instead of the snails? I'd go for some flat rocks on the RBTs base. Some water effect in the cracks if your feel like it. I think the snail is fine - you could paint it up is striking colours for a nice contrasting feature. If you're going for a sea-elf look then grass doesn't add much. The reason to base a model on grass is that it's quick and easy and that it doesn't stand out. The human mind simply ignores it when looking at a model. But that means you're also not using an opportunity to make the model stand out and give it character. So I would indeed go with a rocky beach landing. Some rocks, bit of sand, a few puddles or a bit of water. The snails I'm not sure about. They could work. The WH world is weird enough, so why not. Well, for a long time they could. It ended up on a huge base (double wide, and a little extra long). I just figured it would display, store, and transport more safely if the base covered everything. I'm thinking of adding a fox that's getting started by the chariot as well. 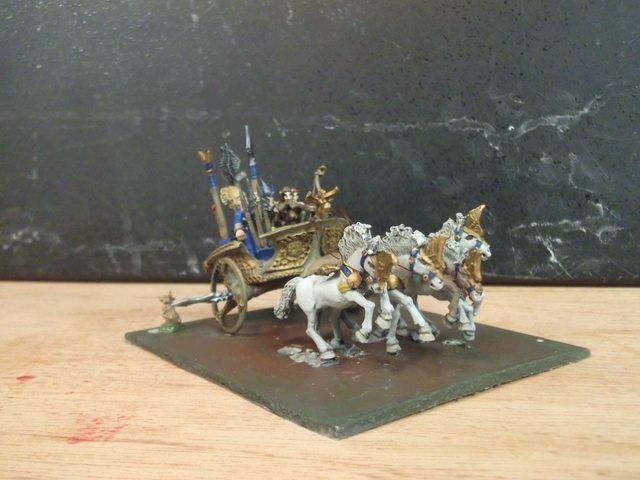 Great job on the Chariot Shannar, I love the gold and the blue. I ended up making two separate chariots and several foot heroes out of my set! Oh and the accessories ended up here there and everywhere! I bought the bolt thrower blister but somehow managed to lose two of the crew. 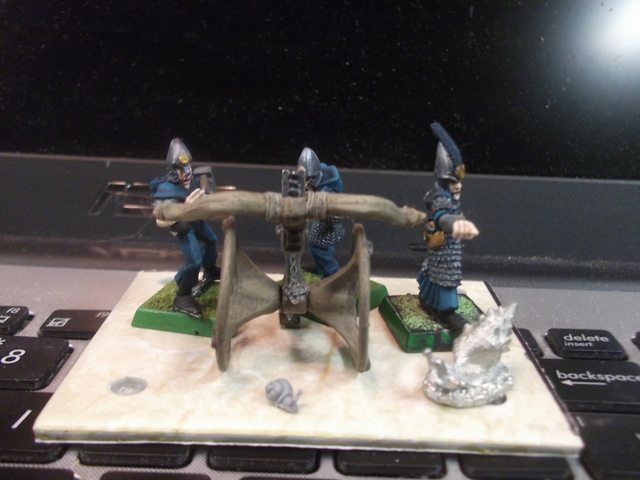 I'd suggest matching their bases with the large base if you go sand etc for that. Just finished 3 eagles. Of the sort that were great eagles, but then got demoted to war eagles. I put together a couple riders (random extra warhawk rider legs and plastic glade guard upper bodies). They aren't really a priority to paint, but they'll be a distraction project. Gobbos are still coming along. Probably will finish those next week. I think I'm finally going to do up my plastic shadow warriors too. I find these require care. They're not horrific but attention to detail pays off.